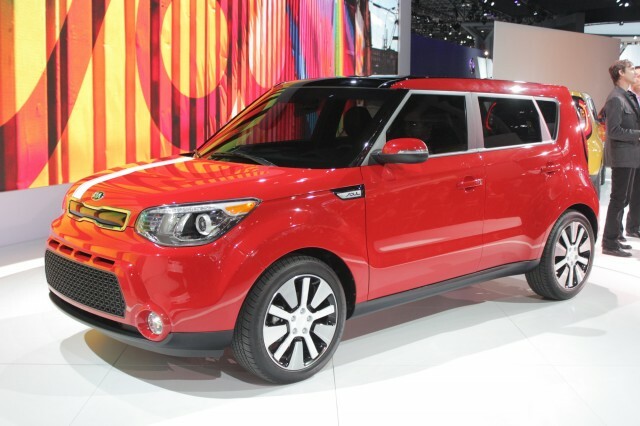 It might not look too different from the old model, but the car you're looking at here is the new 2014 Kia Soul. The Sould might have dropped a few MPG in Kia and Hyundai's gas mileage fiasco but there was little wrong with the way it looked, and the new car simply incorporates a few cues from last year's Kia Track'ster concept. Before we talk styling though, you need to know about the Soul's engine range. A 130-horsepower 1.6-liter unit is carried over (with manual and automatic gearbox options), while Kia's old 2.0-liter unit is upgraded with direct injection GDI technology. It now produces 164 horsepower and 151 lb-ft of torque, with greater punch at lower revs. 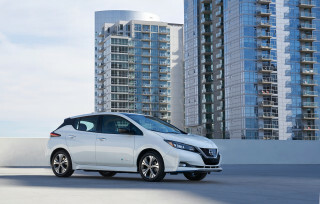 There's no word on fuel efficiency yet--we can expect that info closer to the car's U.S. release in the third quarter of this year. Hopefully, they'll top the existing frugal Soul, the 28 mpg combined Soul Eco. Visually, the Track'ster's most noticeable at the back, where new light units appear to be integrated into the rear glass, as a distinct black line wraps around the tailgate. Up front, the Soul gets a new take on Kia's distinctive 'tiger nose' grille design, some new front light units and a larger lower grille inspired by the Track'ster. The Soul's height has remained, but a longer wheelbase and wider body contribute to a look that's a little more hunkered-down than before, though the distinctive tall body is still a Soul signature. The biggest changes are reserved for the 2014 Soul's interior, also influenced by that of the Track'ster. Round and ovoid forms dominate much of the interior, from the deeply recessed gauges to the door panel trims. Interior space is claimed to be better than ever, and the trunk has also grown. A less upright center stack also features, but the old Soul's mood lighting returns--door speaker surrounds glowing to the beat of your music. We expect the effect is more apparent with Taylor Swift or Maroon 5 than it is with Bach and Vivaldi. Equipment levels are high, with a large 8-inch touch screen infotainment system available on some models. This features Kia's second-generation telematics system compatible with both Apple and Android smartphones. Most of the car's audio, video and navigation functions are accessed through the screen, with navigation instructions backed up by a small TFT screen in the instrument cluster. Pandora, SiriusXM and Google Maps all feature, as does Bluetooth connectivity. Keep an eye on our full New York Auto Show page for more news, live images and details from the show. 2014 Mazda 3: How Does It Drive With i-ELOOP?